For it only being around one and a half miles from John O’ Groats to Duncansby Head, this walk on the beach was most packed with discovery. From the thousands and thousands of white shimmering broken shells lining the coast and the clinking sound they made when treading them to the hollow creaking of the sea working its way up even these shell lined beaches, the rabbits who build their holes in such manner that the whole shoreline looks like an Afghan hiding place for terror rabbits, the ever staring sheep who seem eternally fascinated with you and last but not least the colony of seals you encounter in this one hard-to-reach bay who all men out rush into the sea only to then turn around and be your theatre audience when passing by. Oh, and then there was this rather lucky moment when I almost got my foot stuck into the carcass of a dead seal a bit further along the way, I don’t know how but my body subconciously must have realised that this was not a stone as I had thought and in a spooky way forced me to leap over it. 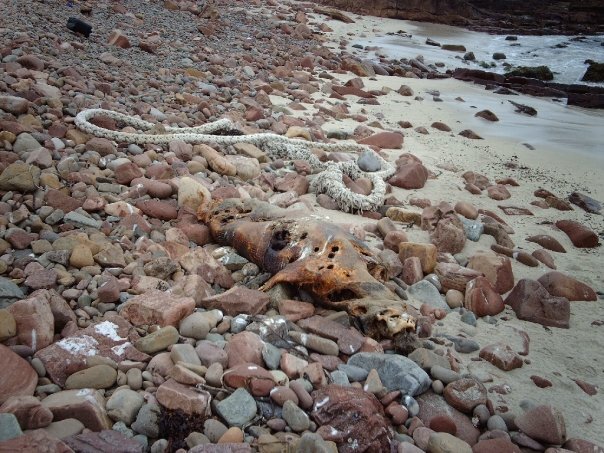 How interesting it is that when I took to closer examine the carcass it was completely hollowed only with the skin and bones and whatever there was inside the head, but also without any smell of either rotten flesh or sea. I take it this was the work of seagulls, as someone once told me they were the police of the seas where vultures were their desert colleagues. Finally reaching the lighthouse by Duncansby Head I was offered the spectacular view of the two twin colums of rock split of the shore standing free like a temple to the sea just behind it and enjoying this for a while then made my way back to John O’ Groats. It now being a more humane time of day there indeed I met some folks. 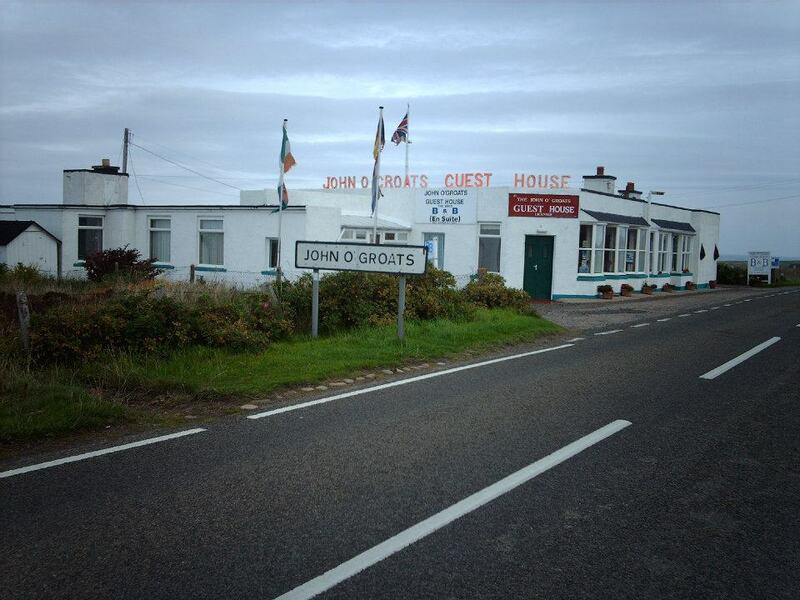 Mainly people setting over to Orkney on the ferry (a joy that I was , for lack of money, barred from) but also one chap who happened to tingle up and down between Land’s End and John O’ Groats on his racing bike every now and then, or whenever he had a weekend off, as he said. Well, with their help I told the obligatory picture by the waymarker and then set for the postoffice to send a card to my parents, letting them know that my journey had (almost) come to an end and I was still alive. But now it was time to hitch a ride home! Next Post → South, south, south: John O’ Groats to London, Part II.